ULTRA MUSIC FESTIVAL, the World’s Premier and most independent electronic music festival brand, is gearing up to deliver a slew of ‘festival firsts’, as it announces its stacked 2016 broadcast strategy. For the first time ever, ULTRA LIVE, presented by UMF TV, produced by NOMOBO and powered by 7UP, will broadcast from a custom built outdoor studio, live from the heart of the festival grounds, where fans will be encouraged to interact with artists and hosts alike. From 3pm to midnight across the entire weekend, hosts Andrea Feczko and Andie Helfrich will orchestrate phenomenal content, including fan and talent interaction. Live sets already confirmed will come from Afrojack, Armin van Buuren, Avicii, Aly & Fila, Andrew Rayel, Carnage, Cedric Gervais, The Chainsmokers, Dash Berlin, Fedde Le Grand, Galantis, Hardwell, Kaskade, KSHMR, Laidback Luke, Markus Schulz, Martin Garrix, W&W and many more. Saturday and Sunday will also see a pair of VERY special guests join Andrea and Andie as they co-host the broadcast, and is not be missed! 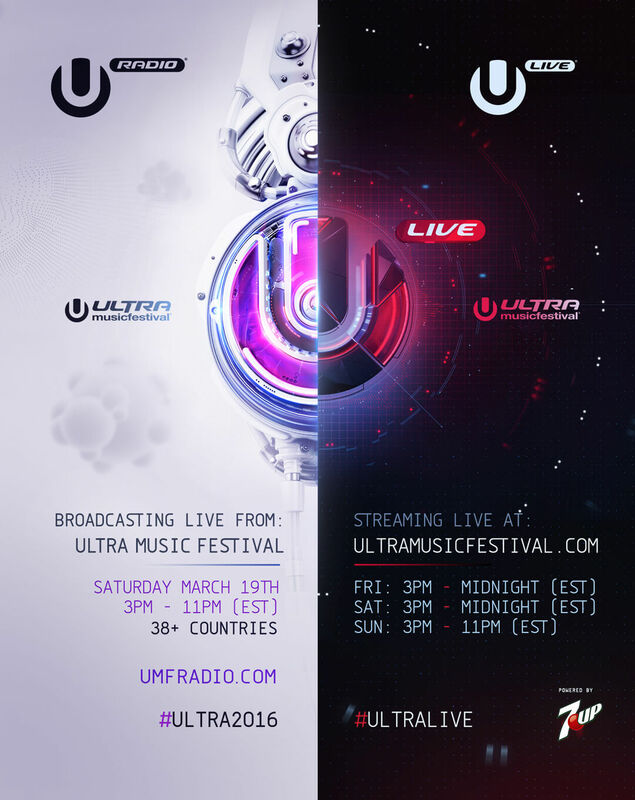 In yet another first for Ultra Music Festival, UMF RADIO hosted by Andy Pate, will deliver the world’s biggest broadcast of Electronic Music content ever, transmitting live for 8 hours across 50 networks, in 38 countries, as well as via the festival’s official app, which has also received a significant upgrade. Among the artists confirmed to participate in this historic live radio event are Apollonia, Carl Cox, Dash Berlin, DJ Snake, Hot Since 82, Jamie Jones, John Digweed, Joris Voorn, Martin Garrix, Richie Hawtin, Steve Angello, Technasia, Tiësto, Tycho, W&W, Yellow Claw and many more. Produced by The Radio Department, the world’s biggest syndicator of electronic radio, this groundbreaking broadcast looks set to break records. Wherever you are in the world, you will be able to experience the SOLD OUT eighteenth edition of Ultra Music Festival in a way never done before. ULTRA LIVE and UMF RADIO can be accessed at www.ultramusicfestival.com, at Twitch TV or by downloading the official app available for iOS and Android HERE! 7UP is one of many flavorful brands in the beverage portfolio of Dr Pepper Snapple Group (NYSE: DPS). A favorite since 1929, 7UP is THE UNCOLA. 7UP is available in Regular, Diet and Cherry varieties. DPS is a leading producer of flavored beverages, marketing 50-plus beverage brands across North America and the Caribbean. For more information, visit 7UP.com or DrPepperSnapple.com. For the brand’s latest news and updates, follow 7UP at Facebook.com/7UP or Twitter.com/7UP.